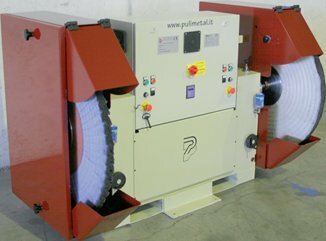 Pulimetal also produces manual machines for grinding and cleaning using the same technology found in automatic machines and Robotic cells. 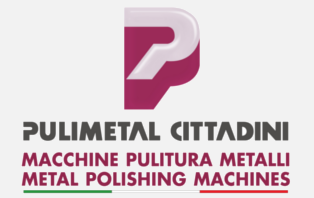 As with the automatic machines even for the manual is a study in the special needs of the customer who can choose the combination best suited to its production. 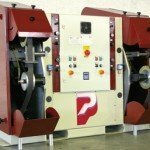 Our manual machines can be completed with all the options you want, and with all the combinations that best meet customer needs. The rotation system of the belt reflects the one used in the grinding robotic cells. The units are then finishing on-demand and specific, making them completely customizable, and the human-made. Executed in carpentry, opportunely over sized, assure stoutness, stiffness and absence of vibrations during working phases. Nr.02 Inverters for speed control. Display for inverter program and parameters view. Contact wheel Width 100 mm. 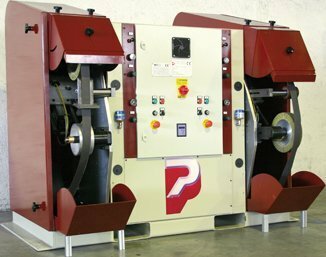 Possibility to install special grinding systems( special wheels, Holding plates , return systems ) for different grinding operation. Dimension machine about 1700 mm x 1000 mm H 1600 mm. 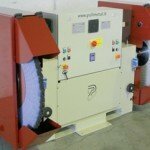 Ø max polishing wheel 960 mm. Referral belt for brush shaft. Blocking knob for cover handling.